Our favourite psychotic penguins are getting back to the silver screen. This time without the help of Marty and the rest of the gang. They are going it alone. The first images from the penguins’ epic, upcoming, film. Penguins Of Madagascar have hit. This set of images are a little disappointing. It looks like, instead of using the same software that the main Madagascar films use, the film has been made on the cheap. In a way it has that direct to video feel to them. The penguins seem to be closer to their animated series selves than what they look like in the films. I hope that DreamWorks can pull it off and not just make it feel like an overly long episode. Will we see cameos form the rest of the animals in Central Park Zoo or do we forget that there is a lion, zebra, hippo and giraffe there. They did it in the animated series that we ignored. With six months to go and a slightly dubious release date as the final Hobbit film will be out at the same time, I am a bit concerned that there isn’t a real synopsis out yet. As you can see, all the synopsis says is “The penguins from the Madagascar films are getting their own film“. Would it be better to make it a late summer release. After the main Super-hero films have made all their money. This will then let the young ones have a chance to see a summer film. 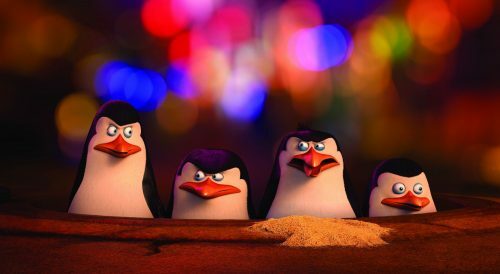 The PENGUINS OF MADAGASCAR are back in their very own feature film! Featuring the enterprising Penguins from DreamWorks Animation’s Madagascar franchise, this 3D comedy adventure stars Skipper, Kowalski, Rico and Private in their very own spy thriller.